With his drip paintings, Jackson Pollock found a new kind of order that inspired future generations of artists in all media to strive for boundlessness. Jackson Pollock, Untitled, circa 1950, ink on paper, 44.5 x 56.6 cm. Jackson Pollock, Untitled (Animals and Figures), 1942, gouache and ink on paper, 57.1 x 76 cm. Jackson Pollock, Number 1A, 1948, oil and enamel paint on canvas, 172.7 x 264.2 cm. Jackson Pollock was born in 1912, in Cody, Wyo. Eight years later, he moved with his family to small-town California. After working for a time as a hotel manager, his father departed with a team of surveyors, returning just often enough so that his wife Stella could never claim to have been entirely deserted. Subsisting on money her husband occasionally sent, Stella was able to resettle her five sons in Riverside, Calif., in 1924. All of her boys had an interest in art. Charles, the eldest, was an accomplished painter—at least in his mother’s eyes. Four years later, the family moved again, this time to Los Angeles. Having discovered that he liked to draw, Jackson enrolled in art classes at Manual Arts High School, on the industrial outskirts of the city. Charles Pollock had by then moved to New York, where he attended Thomas Hart Benton’s class at the Art Students League, on 57th Street. Following his brother in 1929, Jackson, too, studied with Benton. His subjects were landscapes and genre scenes to which his teacher had turned in the mid-1920s. Impressed by the Armory Show of 1913, which had given America a first-hand view of the European avant-garde, Benton had visited Paris and carried out pictorial experiments in a Cubist mode. Disenchanted for reasons he never made clear, he became, at the Art Students League, a proponent of the virtues of Renaissance painters, especially El Greco and Michelangelo. Though Pollock struggled to make those virtues his own, his sketchbooks from 1930s testify to an incorrigible awkwardness. Benton once said that his student had “the most minimal talents.” Yet he allowed that Pollock was “a born artist” who could find the “essential rhythms” of any subject. In 1942 Graham invited him to show recent work in an exhibition he was organizing for the McMillen Gallery, one of the few New York galleries that showed contemporary art in those days. Among the other Americans included in the McMillen show, along with such Parisian luminaries as Henri Matisse and Georges Braque, was Lee Krasner, who was also deeply impressed by Pollock—not as a painter but as a person. Where Graham saw a bumpkin, she saw a shy, irresistibly handsome young man. A star pupil of Hans Hofmann, a formalist with Cubist roots, Krasner could see in Pollock’s paintings of the early 1940s little more than turgid, Bentonesque stumbling. Only after Mercedes Matter, a painter and a friend, had praised Pollock’s thoroughly un-Hofmann-like work, did Krasner begin to glimpse the power that Graham had seen immediately. With her guidance, Pollock found his way into the small, overheated world of progressive painting in New York. The German invasion of France had driven a large contingent of the European avant-garde to the New World, which many of them—the Surrealists, in particular—found uncongenial. Disinclined to take their American counterparts seriously, they formed cliquish circles and waited for the war to end. 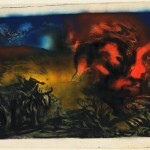 Only Roberto Matta Echaurren, one of the younger Surrealists, made an effort to meet Americans. Pledging allegiance to André Breton, Surrealism’s leader, he became an advocate of automatism—a method of suspending conscious judgments and aesthetic intentions so that imagery, whether verbal or visual, can flow directly from the unconscious mind. Robert Motherwell, one of the youngest of the painters who eventually came to be known as Abstract Expressionists, called Matta “the most energetic, enthusiastic, poetic, charming, brilliant young artist I’ve ever met.” Furthermore, Matta was fluent in English and restless with ambition. With Motherwell’s help, he would recruit the best American artists to a fresh avant-garde; with Matta guiding them, they would set off an aesthetic explosion. Motherwell was game; so was his friend William Baziotes. 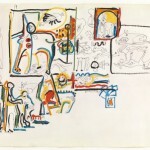 On their advice, Matta invited Arshile Gorky, Pollock, and a few other painters to his New York studio for a demonstration of automatist techniques. Putting Matta’s lessons to proper use, Gorky impressed Breton as the only New Yorker worthy of induction into the Surrealist ranks. The breakaway cadre never formed. In The Guardians of the Secret (1943), quasi-abstract figures guard a cryptic image: a painting within the painting the guardians occupy. Edges reiterate edges, corners echo corners in these works from the early 1940s. Pollock’s willfulness was producing blunt, brutal symmetries. He wanted more command over his medium, not less, and—this is the paradox of his art—he brought his colors under full control only when he began to fling them through the air. And she commissioned Pollock to produce a painting for the lobby of her Upper East Side townhouse. Twenty feet wide and nine feet high, it is filled with writhing tendrils of color, each with a vibrantly figurative presence. Pollock called it, simply, Mural (1943). This was a success and his relationship with Art of This Century had already made him first among equals in the ranks of the New York avant-garde. Yet he continued to be plagued by doubts that drove him to drunkenness and outrageous behavior. The story of Pollock urinating in Guggenheim’s fireplace is fact, not legend. Desperate to remove Pollock from the pressures—and temptations—of New York, Krasner hit upon a plan. They would move to the Hamptons. 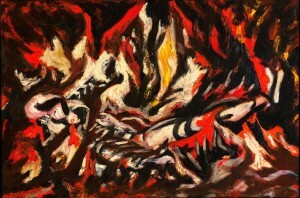 Pollock rejected the idea at first, then changed his mind, and in the summer of 1945 they found a house for sale on Fireplace Road in Springs. It was unaffordable, so Krasner asked Guggenheim for $2,000 against future sales, the amount needed for the down payment. Guggenheim eventually, gave in, explaining that “it was the only way to get rid of Lee.” It was there, in Springs, that Krasner persuaded Pollock to stop drinking—but not until 1946. And it was there, from the end of that year until 1946, that he made the drip paintings that give him his place in the long history of Western painting. Across these canvases, which include Autumn Rhythm, 1950, and One: Number 31, 1950, 1950, paint travels in wide, looping swirls. It streaks, splashes, and spatters. Its force, consistency, and colors shift. Nothing happens on the surface of these paintings save as an urgent response to something else that happened nearby. The texture of a work like this is so far from random that it looks alive to itself, a skein woven from the immediacies of a mind’s self-reflection. All has an open, fluid—sometimes airy—feel, no matter how grim Pollock’s colors become. The eye slithers voluptuously over the surface of this flux and into its depths. 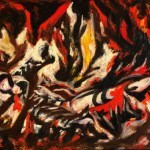 It took a European critic to see the implications of Pollock’s art clearly enough to be horrified by them. Alfieri was entirely in error only when he charged Pollock with having no technique. The most unsympathetic eye should be able to gather even from the frothiest of the drip paintings much evidence of this painter’s command of paint. Obviously Pollock could get his material to loop and splash as he wished. However, Alfieri’s eye was attuned to the checks and balances, the resolved harmonies, traditional composition, so it wouldn’t be fair to expect him to have found in the large patterns of Pollock’s works anything but chaos, disharmony, and a hopeless lack of structure. These paintings are not, after all, traditionally composed. By Alfieri’s standards, which are those of nearly all Westerners, European and American, he was right in coming to the conclusions that he did. When a review in Time echoed the Italian critic’s talk of chaos, Pollock sent a telegram to the magazine proclaiming, “NO CHAOS DAMN IT.” For his drip paintings display order of a new kind, not all-embracing, as in paintings composed the usual way, but thoroughly local. Here and there, a flurry of pictorial incident may appear to be coalescing into a traditional composition, but it never does. If a compositional impulse appears, the painting’s currents sweep it away. Following these currents to the edge of the canvas, the eye senses a shift, for Pollock never ignored edges. He treated them as facts, indisputable but powerless to enclose the image in any but an arbitrary way. Thus there is no point at which a viewer’s path through the web leads to a sense of a neatly unified image. Stepping back, one sees not a resolved composition but an intimation of the infinite. De Kooning said in 1950 that “Pollock broke the ice.” And in Excavation, a large painting from that year, he seems to be inventing his own version of Pollock’s “all-over” image. Yet de Kooning never abandoned his Cubist heritage. A master composer, he was never tempted to leap into a boundless infinite. Moreover, most younger painters were finding their points of departure in him. An exception was Helen Frankenthaler, who said “You could become a de Kooning disciple or satellite or mirror, but you could depart from Pollock.” Devising a variant on his method, more pouring than dripping, she became the first of a small group called color-field painters. Other were Morris Louis, Kenneth Noland, and Jules Olitski. All them found distinctive departures from Pollock’s imagery. Yet it beyond the borders of painting that his art has had its greatest impact. From this preoccupation emerged the new art form called Happenings. Predecessors of the works of performance art that have been proliferating for decades, Happenings were events choreographed with deliberate ambiguity, to leave participants plenty of room for improvisation. In the realm of the art object, Minimalism, with its potentially infinite grids and endlessly replicable forms, found geometric variations on Pollock’s infinite; and this style was raised to the scale of landscape in earthworks by Robert Smithson, Walter de Maria, and others. 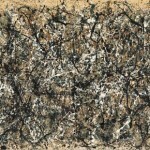 Any work of art that implies boundlessness suggests Pollock’s liberating example, if not his direct influence, which we see not only in open-ended works of performance art but also in sprawling installation pieces, and even in the decoratively patterned paintings that have appeared, in a variety of styles, in the years since his death. 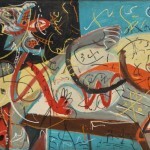 The drip paintings obscured the She-Wolf and the other figures that had populated Pollock’s paintings of the early 1943. In his black-on-white paintings of 1950, figures returned. Some of these works are strong, and yet they signaled a real difficulty. 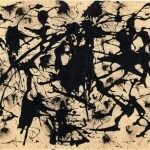 Pollock himself saw no way to move forward from his breakthrough works. Feeling stymied, he began to drink. He tried dripping again, with unsatisfactory results. Flailing about, he found a girlfriend, a would-be painter named Ruth Kligman. This desperate expedient lead to such friction with Krasner that she escaped to Europe. In her absence, he began inviting Kligman to the house in Springs. On August 11, 1956, she arrived with a friend, Edith Metzger. After an afternoon of drinking and squabbling with Kligman, he drove off in an Oldsmobile convertible to a concert at the house of Alfonso Ossorio. The two women came with him and, when he lost control of the car all three of them were thrown out of it. Kligman was injured. Metzger and Pollock were killed. A large boulder marks his grave at Springs.